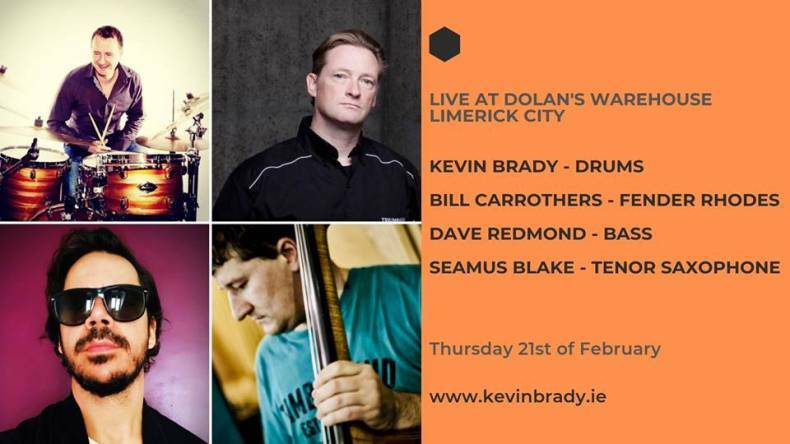 Dublin based Drummer & producer Kevin Brady begins 2019 with a performance by his Internationally acclaimed trio featuring the renowned U.S. pianist Bill Carrothers & long time rhythm section compadre Bassist Dave Redmond at Arthurs Blues n Jazz Club,On Wednesday 20th of February. Joining them for this unique series of concerts in Ireland is leading tenor saxophonist & composer Seamus Blake. He was born in London, England and raised in Vancouver, British Columbia, Canada. His mother introduced him to jazz when he was a child and he later attended Berklee School of Music in Boston.Upon graduation, he moved to New York City.In February 2002, he won the Thelonious Monk International Saxophone Competition. Brady established the trio in 2007 with the clear aim of creating & producing new contemporary music and the impact of this was immediate. Their performances have been critically acclaimed for their dynamism and musicality. Since then, Brady, Carrothers & Redmond have performed regularly and have consolidated their worldwide reputation as a compelling live act. Recording their last critically acclaimed album with with vocalist Norma Winstone. The latest addition of Blake to the trio promises to deliver what will be one of the musical highlights of 2019. "Blake, is a powerful player possessing that rare ability to develop lengthy solos that are both visceral and cerebral. Few artists are capable of delivering near-perfection every time but Blake is one of them, with nary a misstep here and a consistent ability to create a clear narrative with every solo."